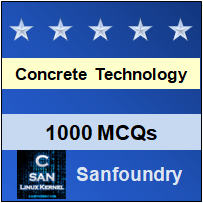 This set of Concrete Technology Multiple Choice Questions & Answers (MCQs) focuses on “Wet Process”. 1. What is wet process? Explanation: Grinding and mixing of the raw materials in their wet state is called wet process and grinding and mixing of the raw materials in their dry state is called dry process. 3. “Size of the kiln needed to manufacture the cement is bigger for wet process”. Is the statement true or false? Explanation: The kiln size is bigger for wet process than for dry process to manufacture the cement because much of the kiln’s length was used up for the drying process. 4. Among the below statement, which one is correct for wet process? Explanation: The amount of heat required is higher, so the required fuel amount is higher for wet process and vice-versa for dry process. Explanation: The slurry with the desired lime content passes into the rotary kiln up to 8 m in diameter and length 230m. 6. The slurry, in its movement down the kiln, encounters a progressively higher temperature. At first, the water is driven off and ___ is liberated. Explanation: In wet process, raw materials can be mixed easily and therefore we don’t need any extra energy and due to this machinery and equipments do not need much maintenance. 8. “When chalk is used, _______” Choose the most suitable option. Explanation: When chalk is used, it is finely broken up and dispersed in water in a wash mill. Similarly, the clay is also broken up and mixed with water, usually in a similar wash mill. Explanation: The kiln is slightly inclined with horizontal so that the slurry coming from slurry tank can free fall with the gravity into the next process. Explanation: At 1300-1450 °C partial (20–30%) melting takes place, and belite reacts with calcium oxide to form alite.